A483 Shropshire northbound severe disruption, from A495 Fourways to A5. A483 Shropshire - A483 closed northbound from Fourways to Mile End Roundabout, because of an overturned vehicle. Ollie Norburn's stoppage-time penalty earns Shrewsbury a dramatic come-from-behind victory against Wycombe Wanderers. M54 Shropshire eastbound severe accident, from J6 for A5223 Lawley Drive to J5 for A5 Rampart Way. M54 Shropshire - One lane closed and slow traffic on M54 eastbound from J6, A5223 (Telford West) to J5, A5 (Telford Central), because of an accident. 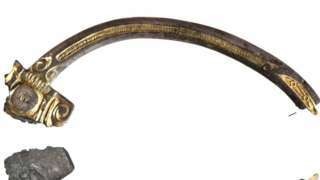 Experts said it was possible the unusual silver brooch, found by detectorists, was created in Wales. M54 Shropshire westbound severe disruption, at J7 for A5. M54 Shropshire - M54 lane closed on exit slip road westbound at J7, A5 (Wellington), because of a broken down vehicle. 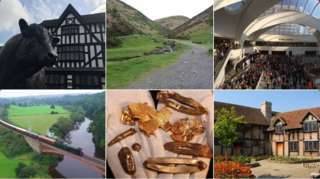 A group of Quakers in Shropshire have asked the local authority to rethink which companies it invests its pension fund in. The Ludlow Quaker Group suggested Shropshire Council puts its money in renewable energy companies rather than fossil fuel firms, saying: "We believe we have a moral duty to leave the world a better place." Thomas Biggins, chairman of the pensions committee, said the council put financial responsibility above all other concerns. Proposals to build 3,000 homes on greenfield land near the M54 at Tong in Shropshire have been criticised by the local MP, who says developments should be built on brownfield sites instead, and accused developers of "dumping" homes on communities. Shropshire Council is working with four local authorities in the Black Country on the plans and says while it doesn't need the extra homes, the development would create a lot of jobs. Mark Pritchard said local residents must be listened to and that it was important any new development had the infrastructure to support it. We are seeing huge numbers dumped on communities with very little consultation and very little thought given to the provision of local GPs or school places and also the environment." Video: What's the weather got in store? It will be a wet and windy night with spells of heavy rain and lows of 6C (43F). Children have been protesting across the West Midlands in a day of action over climate change. They're among thousands worldwide who have abandoned classrooms for a day of demonstrations. The government said the disruption increased teachers' workloads and wasted lesson time. But Environment Secretary Michael Gove backed the protesting children, saying in a video: "Dear school climate strikers, we agree." The Environment Agency is warning rivers levels are likely to continue rising this weekend and it now has four flood warnings in place, on the Severn and Vyrnwy in Shropshire - covering Shrewsbury, Melverley, Maesbrook and Pentre. It also has a number of flood alerts in Staffordshire and Herefordshire, as well as Shropshire. Alerts are in place on the River Lugg at Leominster, the rivers Churnet and Tean, the River Wye in Herefordshire, the Rivers Tern and Perry, the River Severn through Shropshire and the Upper Teme. Flood defences are still up in Frankwell in Shrewsbury. The Environment Agency said it expected levels to remain high there until Monday. Telford Tigers are involved in a three-way battle for the league title on the final weekend of National North season. If they beat rivals Hull Pirates tomorrow, they can claim top-spot with victory over Solihull Barons on Sunday, but only if the other team in the mix, Sheffield Steeldogs, drops points this weekend. The Steeldogs and Pirates can also claim the title, if results go their way. Solihull Barons play Blackburn tomorrow and are assured a spot in the play-offs whatever the results are this weekend, but would love to deny their arch-rivals the league title. And it could be last league meeting between the sides for a while, if Telford Tigers move to the proposed new NIHL division. Coventry Blaze fans have a St Patrick's Day treat, with an away trip to Belfast. They play the Giants today and tomorrow, so fans might have sore heads when they host Fife Flyers on Sunday. Whatever happens over this weekend I’m proud of the guys, we’ve battled adversity and to quote Winston Churchill, ‘Success is not final. Failure is not fatal. It is the courage to continue to that counts.'" Young people walk out of schools and colleges across England to protest over climate change. The railway line between Shrewsbury and Welshpool has reopened after a bridge was damaged by a vehicle earlier. Hull and Sheffield will battle it out to be ice-hockey league champions this weekend. It's to win the National League North, with Hull Pirates, Sheffield Steeldogs and Telford Tigers all in the running. All three teams have 62 points with The Pirates on top of the table. The Environment Agency has said many rivers were already full and with more rain forecast this weekend, it could be "quite significant". Spokesman Chris Bainger said 160 tonnes of water a second was passing down the River Severn in Shrewsbury at the moment - eight times the normal amount. There are now three flood warnings affecting the rivers Severn and Vyrnwy in Shropshire and the Environment Agency is warning river levels are expected to be high throughout the weekend. There are also a number of flood alerts affecting rivers in Shropshire, Staffordshire and Herefordshire and the temporary flood barriers have been erected at Frankwell in Shrewsbury. That river is flowing eight times greater, so it's eight times the number of rivers that are in there at the moment than there would normally be. So there's 160 tonnes a second or 160 cubic metres per second is whizzing past us in Shrewsbury right now." The grey skies this week are continuing this morning across the West Midlands, from the look of the photos from our BBC Weather Watchers. 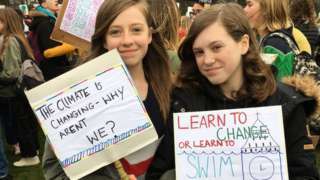 Schoolchildren across the West Midlands have joined youngsters across the planet in abandoning classrooms for a day of protest against climate change. Strikes are taking place today in more than 2,000 towns and cities, in over 100 different countries. The globally co-ordinated children's protests - promoted through posts on social media - have been going on for several months. In Shrewsbury, the demonstration happened at the Quarry with Hannah, 18, saying “I believe there’s no point of us getting an education and planning for the future if there is going to be no future”. Eight people have been arrested and drugs and weapons seized in early morning raids today in Telford. West Mercia Police says officers searched several places in Brookside. Three people were arrested on suspicion of possession with intent to supply drugs and five people were arrested on suspicion of robbery, conspiracy to robbery and human trafficking. Disruption to train services between Shrewsbury and Welshpool's now expected to last until 15:00 after a bridge was hit. Transport for Wales says a vehicle collided with the structure overnight, blocking the line.